As the first buds of cherry blossom start to bloom around the Tidal Basin and throughout East Potomac Park in Washington D.C., the international law community prepares to descend on the nation’s capital for the largest annual event in the PIL calendar. The American Society of International Law’s 111th Annual Meeting will take place in Washington, D.C., at the Hyatt Regency Capitol Hill, from 12 April to 15 April, 2017. Sandra Day O’Connor once observed, “There is no shortage of lawyers in Washington, DC. In fact, there may be more lawyers than people.” With a city motto like Justitia Omnibus (Justice for All), it is a fitting location for a law conference. This year’s theme challenges delegates to consider ‘What International Law Values’, exploring the normative basis of international law and evaluating the success of realizing these goals in practice. 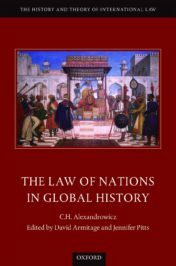 Does international law reflect the values of the international community? Do democracy and development have a place as international law values? How do these values affect the practice and theory of international law? Through the panels and events of the 2017 Annual Meeting, leading and emerging voices in international legal scholarship, policy, and practice will attempt to answer these important questions. To help you get a head start on the panel discussions, Oxford Journals have created a specially curated ASIL conference collection of free articles from across our international law journals, which explore the conference theme. Those familiar with the conference can attest to the jam-packed schedule, full of more than 40 substantive panel discussions on a wide variety of international law topics, not to mention numerous networking and social events to enjoy. This year’s sessions focus on an extensive assortment of topics from law of the sea, space, and climate change, to use of force, cyberwarfare, human rights, and migration. With a vast array of fascinating panels on offer, and an impressive list of participants there is something for academics, attorneys, judges, and students alike. Grotius Lecture: Civil War Time: From Grotius to the Global War on Terror (4:30-6:00 p.m.): Join David Armitage, Lloyd C. Blankfein Professor of History, at Harvard University, for this year’s highly anticipated lecture. International Law and the Trump Administration: National & International Security (9:00-10:30 a.m.): This panel brings together leading experts in the field to discuss this hot button topic. In advance of this panel, explore our reading list of 10 Questions of International and Constitutional Law and the Trump Administration. Reddit IAmA…with David Armitage (10:00 a.m. -11:00 a.m.): Join Oxford University Press and author, historian, and keynote speaker David Armitage for an online question and answer (or AMA) through Reddit. TPP, BREXIT, and After (11:00-12:30 p.m.): This highly topical panel explores the uneasy future of deep economic agreements in the wake of Brexit. Check out our Brexit Debate Map, to learn more about the legal consequences of the Brexit. Under Pressure: The Global Refugee Crisis and International Law (11:00-12:30 p.m.): Syria’s civil war has created the worst humanitarian crisis of our time, but how do we determine who is a refugee? Furthermore, what rights do refugees have under international law? This panel aims to delve into these important and difficult issues. Explore our resources on refugee law, for expert analysis on the essential questions. Foreign Affairs Federalism: A Comparative Perspective (3:00-4:30 p.m.): This panel brings together world experts, to explore the power divide between national and sub-national governments and discuss the unique challenges in international obligations and compliance. Panelist David L. Sloss, winner of the ASIL 2017 Certificate of Merit in Creative Scholarship joins the debate. Why not check out a chapter of his award-winning book. ASIL Annual Assembly (4:45p.m.-6:30 p.m.): Remarks from the ASIL President, and the presentation of the Deák Prize! International Law and the Trump Administration: International Trade (9:00-10:30 a.m.): This timely discussion will tackle the new administration’s approach to international trade, and the role that international law plays in current events. The Regime of Islands in the Aftermath of the South China Sea Arbitration (9:00-10:30 a.m.): On July 12, 2016 the PCA ruled in favor of the Philippines in this landmark case. However, the court would not “rule on any question of sovereignty over land territory and would not delimit any maritime boundary between the Parties“. Both China and Taiwan have rejected the ruling. What does this mean for islands in region, and the future of territory disputes globally? For more in the subject, take a look at our “Disputes in the South and East China Seas Debate Map”. Claims against the U.N.: From Within and Without (9:00-10:30 a.m.): Simon Chesterman, National University of Singapore Faculty of Law, and Patricia Galvao-Teles, United Nations International Law Commission explore questions relating to the UN’s accountability, its privileges and immunities, and how it responds to claims brought against it. Examine some high-profile UN failures and abuses, by reading this chapter on Accountability in Practice. Should the International Criminal Court Privilege Global or Local Justice Goals? (11:00-12:30 p.m.): What should take precedent, local values or global vision? This exciting panel discusses the justice goals and global limitations of the ICC. The Value(s) of International Dispute Resolution (11:00-12:30 p.m.): Yuval Shany, Hebrew University of Jerusalem Faculty of Law and a host of experts discuss the values of international courts. This panel looks at historical and current practices across international courts to identify and analyze the normative values these courts represent and advance. For related reading, here is Yuval Shany’s chapter on The Goals of International Courts. Fifth Annual Charles N. Brower Lecture on International Dispute Resolution (3:00-4:30 p.m.): Join David Caron, Professor of International Law at King’s College London, and Judge with the Iran – US Claims Tribunal in The Hague, for expert insight on all things ADR. Read his chapter on Regulating Opacity to learn more about the issue of transparency in international arbitration. Keynote Address (5:00-6:30 p.m.): Do not miss this year’s keynote speaker Sandie Okoro, Senior Vice President and General Counsel of the World Bank Group. Valuing Women in International Adjudication (9:00-10:30 a.m.): To what extent does international law value the participation of women in international adjudication? Are women equally represented on the benches of the world’s international courts? Learn how women are shattering the glass ceiling and what more needs to be done for women’s equality in the international legal arena. Visit the America’s Presidents exhibition at the National Portrait Gallery, for a chance to view the nation’s only complete collection of presidential portraits outside the White House. Also, don’t miss Nelson Shanks’s The Four Justices, a tribute to the four female justices who have served on the U.S. Supreme Court. Visit the Smithsonian’s National Zoo’s most famous residents, giant pandas Tian Tian, Mei Xiang, Bao Bao, and baby cub Bei Bei. Online visitors can catch a glimpse on the Panda Cam. National Cherry Blossom Festival Parade – Saturday, 8 April Nothing epitomizes spring like cherry blossom. If you happen to be in town early, this world-renowned annual festival is worth checking out. Southwest Waterfront Fireworks Festival – Saturday, 15 April The perfect way to end your ASIL experience. While there will be many vantage points, the Waterfront Park is an ideal location to take in this show stopping spectacular. Feeling hungry? Head over to Union Market, the epicenter of culinary creativity in D.C., with over 40 local vendors and much more. Need a reason to return? A new exhibition at the Library of Congress, “Drawing Justice: The Art of Courtroom Illustrations,” will feature original art that captures the drama of high-profile court cases in the last 50 years. Opens 27 April through 28 October, 2017. If you are lucky enough to be joining us in D.C., don’t forget to visit the Oxford University Press booth, where you can browse our award-winning books, and take advantage of the 25% conference discount. Stop by to enter our prize draw for a chance to win $150 worth of OUP books, pick up a free access password to our collection of online law resources, and browse our international law journals. If you’re feeling interactive, we will have speech bubbles for attendees to fill with their international law values to post online with #MyInternationalLawValuesAre. To follow the latest updates about the 111th ASIL Annual Meeting as it happens, follow us on Twitter @OUPIntLaw, and on Facebook, using the conference hashtag #ASILAM. We look forward to seeing you in D.C.! Featured image credit: “White House”, by tpsdave. CC0 public domain via Pixabay. Jo Wojtkowski is Marketing Manager for Academic Law at Oxford University Press.